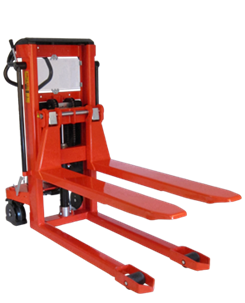 The Logitrans LF Mini Stacker is a manual lift, manual push stacker with adjustable forks. Various attachments can be exchanged for the forks such as drum handlers, drum rotators, reel booms, lifting jibs, platforms and any customers specified bespoke attachment. The LF Mini Stacker is also available with straddle legs which is model LFS. The LF Mini Stacker is available in 920mm and 1650mm lift heights. The Logitrans range of stacker trucks offers high flexibility and efficiency – with only one truck, goods can be transported, lifted and handled in many different ways. The design puts focus on the safety and ergonomic working conditions of the user – Logiflex can be adjusted to the individual user, and the ergonomic correct handle ensures the user a relaxed hold. Optimum utilisation of the space – Logiflex has a compact construction and is very manoeuvrable, with a range of lift heights up to 3300mm and variations of manual and power lift and drive units, the Logitrans Stacker can offer many solutions to your lifting problems.